Doctor Aquarium monitors the health of your aquarium and takes actions so it will not get sick. 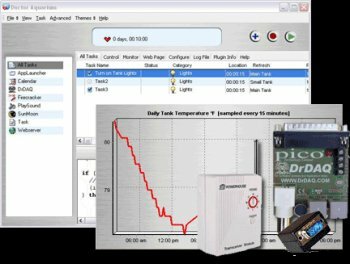 It works with standard X10 home automation modules, and can measure pH, temperature, light levels, sound levels, voltage, resistance, and other parameters using a DAQ board. The program features email alerts, and a web interface that lets you monitor your aquarium over the Internet. The built in task wizard will help you teach the doctor how to perform tasks with out programming.